The first time I gave Peso a bath I accidentally dyed him blue. Not kinda blue. He was white. And then he was BLUE. Through and through. Like a smurf. How did that happen? Great question. I rinsed him with a bucket of water to which I had added liquid bluing– which is something I had done with my family’s dog growing up. It’s used to brighten white laundry – and dogs. I didn’t think too hard about the details of how we used this on my dog growing up and instead of putting a few drops in the bucket of water, I used about a quarter of the bottle. I essentially poured a bucket of blue food coloring over my primarily white puppy. And it STUCK. I shampooed and rinsed him several times and the blue wouldn’t budge. There was an intermission in this whole ordeal in which Blue Peso ran around my house rolling and shaking all over the place. 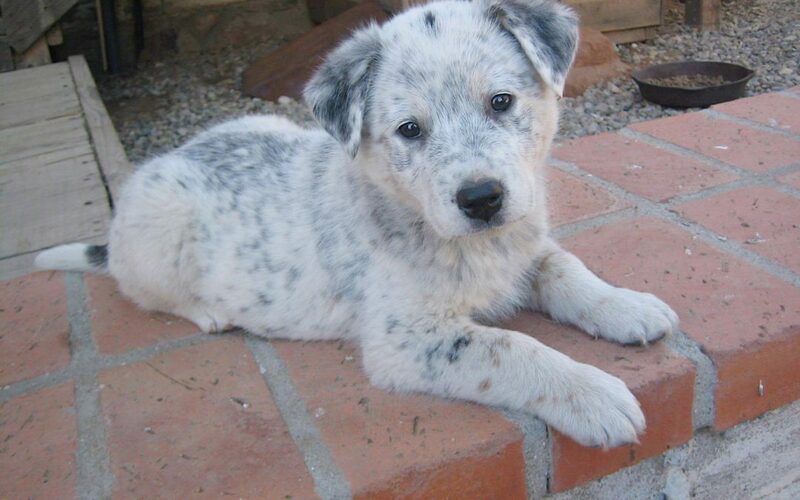 His breed is Blue Heeler. Hilarious right? The blue Blue Heeler. Adorable! NO – I was mortified. Luckily, when I called my mom in a panic she knew what to do. My mom is kind of like a Martha Stewart – MacGyver hybrid — so if you ever find yourself in a similar situation, let me know, because Cheryl will know how to fix it. The fix this time was Dawn dish soap which is what they use to clean animals after oil spills– specifically “Dawn” brand, which I had because my mom had stocked my house with it, presumably for just such an emergency as this. Cheryl is always prepared. So, Blue Peso went back into the tub and got washed about 8 more times with dish soap and eventually the blue came out and he was just very bright white. And very clean. A memorable first bath to say the least. The image of that wet blue silly puppy running around my house is now one of my favorite memories of all time – and only I know how blue he really was – because I did not take a picture. I was way too mortified to document the situation. Almost exactly 5 years after the blue bath I was giving Peso another bath that would also turn out to be memorable. I was soaping him up when I heard a voice in my head. A voice that was in my voice but was not my thoughts – like a premonition. This is something that has happened to me since I was a child and I’ve always had an “it’s complicated” relationship with this voice. It interrupts my life at inconvenient times, sometimes it is shocking, lots of times I don’t like what it says – but what I’ve learned over time is that it’s not trying to hurt me – and – it’s always right. My whole body tightened and the apertures in my heart and ears slammed shut. So, after I tensed, I paused. And then I opened instead. I took a breath and I let the information in. This would likely be Peso’s last bath and I could both hope that wasn’t true and accept it at the same time. And with that, I experienced that bath differently. I savored it. I ran my fingers through his fur and tried to acknowledge every spot. I lovingly rinsed every part of him, like a ceremony of thanking his body for all the memories it let us make together. I cherished this memory as it was happening. Peso was not the biggest fan of baths so he grew tired of me taking my time with my deep moments and life sped back up to it’s normal cadence when he jumped out of the tub and shaked and did his routine of running around the house, rolling on rugs and rubbing against furniture while celebrating his freedom from the torture. And just as he always did – he led me through this part. The story of his first bath and last bath pretty much sums up my life with Peso – which was ridiculously silly and joyful and also serious and deeply profound. He was born into my hands on my living room floor and died in my arms on my living room floor. I had the privilege of taking in his whole life – not just from first bath to last bath but from first breath to last breath. In between those breaths there were a hundred million moments that happened between just him and me – many of which were consciously cherished — and — also held loosely. Because truly present is what he taught me to be.